Flyfishing and bike riding are two of my passions. They also have the capacity to be two of the most technical and confusing hobbies. I get it; I have a garage of bikes each with its own unique function. I also have many different rod, reel, and line combinations each for different species, water conditions, and times of year. Sometimes you just have to shed all of those choices and complexity. Yesterday, rather than loading up my car with a few rods, multiple fly boxes, and driving out to any river of my choosing no matter the distance I chose instead to simplify the process. So I strapped my tenkara and its tube to the downtube of my Stache and started pedaling. I’ve taken rods on the bike before but I have always had to strap them to a pack because of their length and the fact that the reel is usually attached. However the telescoping feature of the tenkara rod makes zip-tying it to the bike simple and effective. I just made sure that I could unscrew the cap without snipping the ties. The tube hangs below the bottom bracket a little more than I wanted it to but as with most home remedies the function outweighed the form in this case. Here’s how it goes: get to the river under your own steam, shed the helmet, flip the bike, remove the rod, attache the tippet, and get in the water. Super simple. No time wasted finding a suitable spot to stash the car or picking the right rod. Just get to it. This first trip was an experiment. Trying new things is always a little difficult for me for me and I was especially unsure about my rod attachment method. But it appeared to have held nicely and the rod went together without a hitch. Luckily finding fishable water is not a problem in our area and in 11 miles I was in the middle of a great trout stream without a soul in sight. A few casts in I found a taker. Earning things always feels better than having them handed to you. This was definitely an experience that was earned. I got to the river under my own power and used a very limiting technique which relies only on water reading and fly placement. It was beautiful, satisfying, and restorative. Get out there, try something new, and squeeze more adventure out of your everyday. This is not a sponsored post. Learn more the tenkara method here. Check out this post for more Stache action. Mankind constantly strives to create perfect items and moments. However, we will never ever be able to manufacture the level of perfection that is a wild Brook Trout at the end of a fly line. This feisty little guy whacked a nymph the size of his head and gave a fight that rivaled fish twice his size. 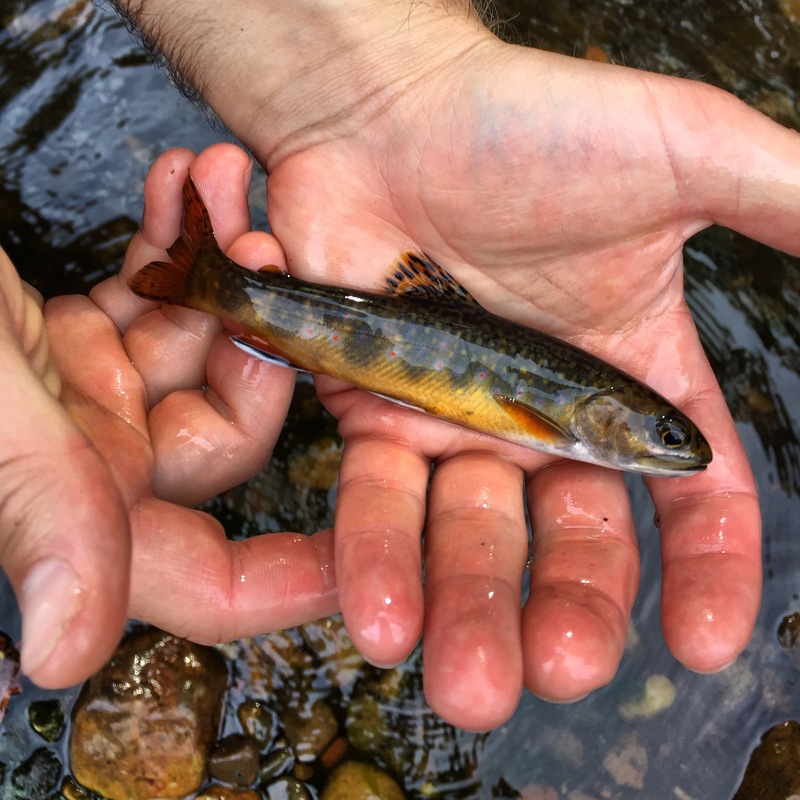 Cherish the little Brookies and let them go; they’ll be there when you come back. Kovas Palubinskas on You asked for it. You asked for it.… on The missing piece. The Flannel Dispatch: News from Superiorland and the pursuit of active lifestyle in the Great Lakes region.